PG Flow Solutions' new CEO Steve Paulsen (right) and former CEO Roy Norum (left). 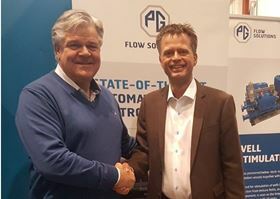 Norwegian liquid handling and pump specialist PG Flow Solutions has promoted chief operating officer (COO) Steve Paulsen to the role of chief executive officer (CEO). Paulsen (46) succeeds Roy Norum (62), who moves into his preferred role as executive vice president sales & business development, overseeing the group’s sales, marketing and business development activities globally. The leadership change is part of a long-term succession plan which was mapped out in 2014, when Norvestor VI LP, a fund advised by Norvestor Equity AS, became the majority owner of PG Flow Solutions. Paulsen joined PG Flow Solutions in 2015 as the company’s first COO. He had previously spent almost a decade with Siemens, as head of operations within energy, oil & gas solutions, head of global sales & project execution, and head of sales & regional support. He has also spent a number of years in project director roles for Nokia Siemens Networks. “Having worked closely with Roy for the past three years, I know how demanding the CEO role is. But we have planned this change since 2015 so it is great to finally make it happen. PG Flow Solutions is a fantastic company and I look forward to leading this highly capable team. Having Roy continue in such a vital role is also a major advantage, both to PG and in support of my new function,” said Paulsen. Meanwhile Norum moves into a new role as executive vice president sales & business development. Norum has been with PG Flow Solutions for 18 years, and more than 40 years in PG’s core business segments globally. He is a significant shareholder of the group, and will continue as a senior member of the group’s management team. “Sales and business development has always been closest to my heart, so I look forward to dedicating myself to this role full time. The maritime and oil and gas industries have been through a couple of challenging years, but we are finally seeing signs of recovery in these markets. In addition, we are rapidly expanding into new sectors, such as the aquaculture and fisheries segments. This positive momentum is something we aim to capitalise fully on,” said Norum. Norwegian pump and pump solutions company PG Group is changing its business name to PG Flow Solutions from 1 June 2015.